EXPERIENCE + KNOWLEDGE + ENTHUSIASM = RESULTS! Continued from page 1. Accreditation was achieved once directly employed staff were moved to the wage and commitments were in place for contractors to also move to it. Council and we actually got there about 18 months ahead of schedule,” says Wellington Mayor Justin Lester. “Research from around the world shows that paying a living wage brings benefits to employers, to staff and also to the wider community. “This was the right thing to do to make Wellington a more inclusive city. 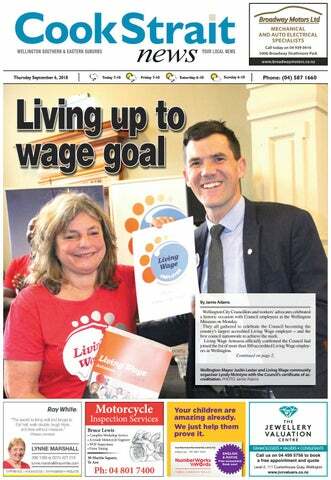 “I know a lot of other local authorities are also taking steps towards becoming living wage councils, which is great for all of New Zealand.” The Council has now joined the ranks of local living wage employers such as Pivotal Thames, The Rogue & Vagabond, Fix & Fogg and Berl. One council worker benefiting greatly from the living wage is Ahmed Diini of Newtown. Ahmed, who came to New Zealand as a refugee from Somalia in 2013, was working 60 hours a week on minimum wage as a cleaner, making spending time with his family very difficult. “I couldn’t take them to the park I couldn’t go to their school activities,” he said. Ahmed’s contracted company cut his hours after his pay was increased to that of a living wage, but it’s meant he is able to see his children more while still being able to support them. “On behalf of low-paid workers I would like to thank campaigners. Councillor Fleur Fitzsimons, who holds the living wage portfolio, says it is a measure of the Council’s commitment to supporting “responsible employment and fair remuneration”. She says all employees have been on at least the living wage since 2017 and all contractors will follow suit as their contracts are renewed over time. As part of its 10-Year Plan, the Council has budgeted $3.4 million per year for 10 years to implement the Living Wage over time. This includes costs for council, council controlled Organisations and core contractors. Work will be getting under way on the section of Oriental Parade between Herd Street and Freyberg Pool from Monday so the planned street improvements can be completed before the busy summer season gets into full swing. The 350m section of pathway in this area is too narrow at busy times to safely accommodate the large numbers walking, biking and running – so the layout on the road side of the trees is being altered to provide more space for people. usual spaces are unavailable, and the contractor Downer will work with local businesses to ensure deliveries can happen. All the angle parking will be reinstated when the construction work is complete, and the road will be resealed and remarked. During the construction, people on bikes and on foot will be able to use the shared path on the seaward side as usual and get to all businesses and facilities. Work hours will generally be Monday to Friday, 7am to 5pm. Some Saturday work is possible. Traffic management will be in place around the construction area, including a 30km/h speed limit. The bus stop near Herd Street is being permanently removed and will cease to function as soon as construction begins as it is within the area being fenced off. The work is expected to be completed during December. These prices only available at Thirsty Liquor, Cambridge Terrace… Specials valid until 30th September 2018 Management reserves the right to refuse sale of liquor to under age and those deemed unfit for purchase thereof. Offers and specials are subject to stock availability, and can be retracted at the discretion of management. inbrief news Conference focus to promote quality of life An international conference hosted by Victoria University of Wellington, New Zealand Treasury and the International Journal of Wellbeing is showcasing the latest research on wellbeing and public policy. Today’s Third International Conference on Wellbeing and Public Policy brings together over 350 people, including policymakers and wellbeing researchers, to share the latest findings on quality of life and how to promote it. Eighteen different streams of talks include Māori wellbeing, children’s wellbeing, post-disaster wellbeing, and housing and wellbeing. The conference concludes tomorrow. Professor Grant Guilford has been reappointed for a second term as Vice-Chancellor of Victoria University of Wellington. Chancellor Neil Paviour-Smith says Grant brings the ideal mix of leadership, experience and knowledge to continue the University’s focus on providing New Zealand’s best student experience and enhancing its standing as New Zealand’s first-ranked university for research quality. Grant says it is a privilege to lead the university and he is looking forward to the challenges that lie ahead. His reappointment will run until the end of 2022. One of New Zealand’s finest chamber music ensembles, the Wellington-based Aroha String Quartet, will play in central Wellington on Wednesday, September 26. Their dynamic Light & Dark concert uses four pieces to explore a range of moods and sound worlds to show how music brings out human emotions. “Our Light & Dark programme takes the audience on a journey from light, to dark and back again,” Aroha Quartet first violinist Haihong Liu says. The concert, to be performed at St Andrew’s on The Terrace at 7.30 pm, is part of a series the Aroha Quartet is performing around New Zealand. inbrief news Fewer Kiwis read books A total of 442,600 adult New Zealanders didn’t read a book in the past year, according to new research out today. Books are competing with television and computer screens for our leisure time, and 45-54 year olds had the lowest percentage reading of any age group. The 2018 New Zealand Book Council study also found that fewer Kiwi men are reading books. It reports that 86 percent of New Zealand adults had read or started to read at least one book in the past year, down from 88 percent last year. Nuisance calls plaguing consumers Seven out of 10 consumers have been on the receiving end of unwanted phone calls from companies in the past year, with 30 percent getting nuisance calls at least once every fortnight, a Consumer NZ survey has found. Across the Tasman, the government stepped in and set up an official Do Not Call register. It’s illegal for any company to call a number listed on this roll. In May 2018, a double-glazing company was fined A$25,200 for calling numbers on the register. Consumer NZ wants a similar register established here. free lessons one term per year. Aquazone will also provide lessons to neighbouring St Anne’s School and a nearby early childhood centre at the pool, as well as discounted paid lessons to the wider community. Work is expected to begin in December and Mark anticipates it will be completed by mid2019. help strengthen the Maori language. Come and join a parade or watch and support te reo Maori.” Ngahiwi says the parade is for everyone – schools, students and teachers, businesses, government agencies community groups, families and everyone in between.  To register for joining the hikoi, go to http://www.tetaurawhiri.govt.nz. Bus users have another opportunity to have their say over the new network that has been plagued with problems since July. Rongotai MP Paul Eagle will stage another community meeting on the bus issues tonight at 7.30pm at the Gospel Church, 33 Park Road, Miramar. There will be representatives from Greater Wellington Regional Council and the Wellington City Council to answer questions. after Te Papa and the Cable Car. It is classified as a Garden of National Significance by the Royal New Zealand Institute of Horticulture and is a Historic Places Trust Heritage Area. Planned since 1844, it was entrusted to the New Zealand Institute, the forerunner of the Royal Society of New Zealand, in an Act of Parliament in 1869. A year from now - Tuesday, September 3, 2019 - will mark the 150th anniversary. Wellington Gardens manager David Sole says the area was once an essential food basket for Maori and is steeped in local history. “Its founders recognised the importance of the Botanic Gardens in the capital. They were the only ones in New Zealand to have an economic mandate.” Today the Botanic Garden contains protected native forest, conifers, specialised plant collections, colourful floral displays, and space for a range of activities. It also has a small part to play in popular culture. In 2010 it was mentioned in an episode of The Simpsons, which featured the stars of Flight of the Conchords. The 150th celebration events will involve four themes that highlight key aspects of the garden: history and heritage, family and community, science behind the collections, and will finish the year by exploring the future. To eNTer: email your name and phone number to: win@wsn.co.nz with the subject line Russian Ballet. Entries close Thursday 13th September 2018. ^ DEALS AT GUTHRIE BOWRON !#*#.!a. FREE We’ll even come to walls you a FREE in-home measure and DEALS AT GUTHRIE BOWRON even come to quote you for in-home measure and quote^! PLUS, PLUS, freshen freshen up upyour your wallsfor with with 25% 25%off offWe’ll aahuge huge range range of of wallpaper wallpaper # # range of blinds by Rightwith now,25% Guthrie Bowron is Right lowering a wide up your walls offcome a huge of wallpaper . . 25% now, Bowron is lowering a wide range#.of blinds by PLUS, freshen up wallsGuthrie with off a huge range of wallpaper For ForPLUS, these thesefreshen great greatblind blind and andwallpaper wallpaper offers, offers, come on onrange in into toyour your local local 15%*, including Venetian Blinds, Sunscreens, and Blockout Rollers. 15%*, including Venetian Blinds, Sunscreens, and Blockout Rollers. Guthrie Guthrie Bowron. Bowron. For these great blind and wallpaper offers, come on inblind to your For these great andlocal wallpaper offers, come^ on in to your local We’ll even come to you for a FREE measure Guthrie Bowron. We’llin-home even come to youand for quote a FREE!in-home measure and quote^! Guthrie Bowron. Weekdays 7:00am–5.00pm Saturday 8:30am–4:00pm Sunday # 10:00am–4:00pm # PLUS, freshen up |your walls with 25% off a huge range of wallpaper . a huge range of wallpaper . PLUS, freshen up your walls with 25% off For these great blind and wallpaper offers, come onand in to your local For these great blind wallpaper offers, come on in to your local Guthrie Bowron. Guthrie Bowron. *Exclusions *Exclusionsapply. apply.Please Pleasesee seein-store in-storefor fordetails. details.Orders Ordersmust mustbe beconfirmed confirmedby by1 1October October2018 2018totobe beeligible eligiblefor forthis thisoffer. offer.^Travel ^Travel # distance distanceparameters parametersmay mayapply applyfor forfree freein-home in-homemeasure measureand andquote. quote.#Offer Offerends ends1 1October October2018. 2018.Indent, Indent,nett nettpriced, priced,and andother otherselected selected *Exclusions apply. Please see in-store for details. Orders must be confirmed by 1 October 2018 to be eligible for^Travel this offer. ^Travel *Exclusions apply. Please see in-store for details. Orders must be confirmed by 1 October 2018 to be eligible for this offer. wallpapers wallpapersare areexcluded excludedfrom fromthis thisoffer. offer.Please Pleaseask askin-store in-storefor fordetails. details.Not Notavailable availableininconjunction conjunction with with any other otheroffer offer orordiscount. discount. *Exclusions apply. Please seeany in-store for details. Orders must be confirmed by 1 October 2018 to be eligible for this offer. ^Travel # distance parameters forin-home free in-home measure and#quote. Offer ends 1 October 2018. Indent, nett priced, and selected other selected distance parameters may may applyapply for free measure and quote. Offer ends 1 October 2018. Indent, nett priced, and other distance parameters may apply for free in-home measure and quote. #Offer ends 1 October 2018. Indent, nett priced, and other selected wallpapers are excluded this offer. ask in-store for details. Not available in conjunction withoffer any other offer or discount. wallpapers are excluded from from this offer. PleasePlease ask in-store for details. Not available in conjunction with any other or discount. wallpapers are excluded from this offer. Please ask in-store for details. Not available in conjunction with any other offer or discount. The lyrics to Bipolar Anthem by Ssendam Rawkustra (written by the late Tim Bell of Newtown) Eat and Sleep! Eat and Sleep! Take Your Pills! Read if you can! Shower if you must! Smoke all the time! Red Jersey, Green Jersey, THAT IS ALL! to pay for art supplies, signage and to fix the building’s leaky roof A public launch party will be held on Saturday, September 8 from 3pm-6.30pm. Mayor Justin Lester and Rongotai MP Paul Eagle will speak before music performances from various bands. One of them will be Seendam Rawkustra, which is still going strong 11 years after mental health nurse Kieran Monaghan encouraged patients to play music together as a way to socialise. There will also be an interactive percussion jam, artists’ exhibitions and free workshops. 1080 pellets, which campaigners say are doing more harm than good. of poisoning town water supplies in war times because it can affect the human body in parts per trillion,” Chris says. “It was deemed too dangerous to handle so was never used by the German SS. “The NZ public are now speaking out in larger numbers and demanding that 1080 be banned.” A recent petition on the Change.org website attracted more than 25,000 signatures. Operation Ban 1080 believes DOC should stick to traditional trapping methods for killing rats and possums. Chris says if poison was to be used, cyanide would be safer as it breaks down in the dead animal’s system within a few days whereas 1080 can take months. “When rats eat the pellets they will die but then the moreporks eat them and the moreporks then die.” Predator Free Wellington spokesperson Kylie Reeves would not say if it supports the protest, but adds that it has no plans to use 1080 in any of its pest-eradication projects. believes in the power of movement for positive social change. “I am excited that Erica Rose Jeffrey from Dance for PD Australia will be providing the opportunity to grow the number of people teaching dance for people with Parkinson’s in Aotearoa,” says physiotherapist at TBI Health, Rachel Horwell. Rachel, who runs weekly Dance for PD classes in Porirua and Lower Hutt, is eager to hear from anyone considering attending the workshop and wants to see as many people with Parkinson’s as possible empowered through dance. The teacher training workshop will be held at Te Whaea: National Dance & Drama Centre, 11 Hutchison Rd, Newtown, on September 8 and 9. There will also be a free community class followed by light refreshments and discussion on Sunday, September 9 at 11am at the same venue. Building Standard rating which will significantly improve our resilience as a Council, which is important given our role as a first responder in an emergency.” Mr Lavery says while the temporary address is at The Terrace, it has convenient lift access from Lambton Quay so people will have flexibility for access. The Council’s customer-facing service centre and contact centre will relocate to retail space in the CBD. Negotiations are underway over a preferred location. readers have their say... Find out the WORD on the Street. Q: Should all employers adopt the $20.55/hr living wage as Wellington City Council has done? Elley Wagner, Mt Cook As someone on the minimum wage I would like to see the living wage be adopted by the majority of business. It could benefit companies if they were branded as [a living wage employer]. Esther McDowall, Mt Cook I have worked in workplaces where people were underpaid. With the living wage, if it gets to the point where it’s not sustainable [employers] might pay illegally more often. Ewan Robertson, ex-Island Bay It’s not a simple thing to do. To employ someone on the living wage I would have to factor that in my budgeting. But I would be happy to pay more for a coffee if it meant they were paid fairly. Melina Martin, Island Bay I don’t know if it’s entirely viable. It would be good if everyone could afford to pay that much. Tony O’Halloran, Island Bay Yeah. I think everybody deserves fair recompense and the ability to have a healthy life. Charlie Mortimer, Island Bay I’d say yes. It would ensure I’m able to look after myself. Many regional councillors don’t live in Wellington City Dear Editor, Threatening ballot box retaliation for the new bus system fiasco must be considered carefully. The Regional Council, which unfortunately is charged with Wellington City transport planning, is dominated by the northern reaches of the region which have a different view of transport for Wellington than we do in the remaining minority City Council area. These current bus changes cannot be separated from the long term planning for transport upgrade, including the so-called ‘Let’s Get Wellington Moving’ initiative. They are wetsuits, and are appropriate for summer Dear Editor I disagree with Mr Westfold (Aug. 30) with regard to the front page a r ticle (CSN, Aug. 23), which profiled the launch of local fashion designer, Gemma Cornish’s, summer wetsuit collection. Mr Westfold claims that the garments are “misnamed”, that they are not wetsuits because wet suits are made of thin rubber, and they cover almost the whole body. Sale End of Season Sale * End of Season Sale * offUp Store wide! to 50% off Store wide! * Up to 50% off Store wide! do Symphony and a regular conductor with Australian orchestras. As well as praise for conducting classical repertoire, Christopher is known for his passion for music written for film, television and video games. For a concert with the Colorado Symphony he even dressed as a T-Rex while conducting music from Jurassic Park. This year he conducted the West Australian Symphony Orchestra performing music from Star Wars, Doctor Who, Game of Thrones and Star Trek. “I’m thrilled to be making my debut with the New Zealand Symphony Orchestra to explore the whimsical music of Harry Potter,” says Christopher. “It doesn’t matter if you’re from Gryffindor, Hufflepuff, Ravenclaw or even Slytherin, there is something for everyone so be sure to hop on your broomstick and join us for a night of magic.” The Music of Harry Potter is the sixth NZSO concert programme this year featuring music from film, video games or television. End of Season Sale * Up to 50% off Store wide! Up to 50% off Store Wide! * LAST DAYS OF SALES! he same item anywhere else for less, beat that price! Rugs Direct Price Guarantee. If we'll you ﬁnd the same item anywhere else for less, we'll beat that price! ce Guarantee. If you ﬁnd the same item anywhere else for less, we'll beat that price! If you ﬁnd the same item anywhere else for less, we'll beat that price! ek! Rugs Direct Price Guarantee. • Open 7 days a week! A R E YO U R F E E T G E T T I N G H A R D TO R E AC H A N D T E N D TO? As one of the most important and growing groups of New Zealanders, we wanted to provide for you the one place to go to for relevant and engaging articles across all areas of interest – the chance to have your say, share stories and meet like-minded people. having trouble hearing, make an appointment today and see our friendly, caring team at Courtenay Hearing Centre. Millions of people all over the world prefer not to fly on aircraft. Some have never flown and don’t know what to expect; others have to fly regularly but are extremely uneasy about the whole process. The Flying Without Fear programme has helped thousands of New Zealanders become more knowledgeable, relaxed and interested passengers as free to travel by air as they are to drive in their own car. M I R A M A R B O W L I N G C LU B I N C . Miramar Bowling Club is a vibrant progressive Club providing an opportunity for the community to come and Have a Go as well as providing for those competitive members with competition bowls. so a chance to participate at a time that suits you. You do not need to know how to bowl, as we will help you with equipment and coaching. Come along all. Come and have a go, and stay for a meal. Everything provided, along with coaching. Registrations for next Wellington course are now being taken. significance and importance of Maui. Donovan worked under the guidance of Dr Darryn Joseph, who also translated the te reo edition, along with Keri Opai. “Working with Darryn really opened my eyes to some of the deeper layers and meaning behind Maui’s story. Even though my version is aimed at young readers, there are a lot of other layers of Maui’s story woven in.” Donovan will be reading, drawing and signing books at this free event at 2pm at The Children’s Bookshop, Shop 26 Kilbirnie Plaza, on Saturday September 8.
bandry procedures to companion and working animals like dogs and horses. “With under a month to go until these new regulations come into effect, we want to encourage people, who are responsible for any type of animal, to check they are up to date in how they are looking after them,” says Chris. “Our team has been working with industry and sector groups to raise awareness of the regulations and ensure people understand and can meet their responsibilities. “The majority of the regulations reflect existing standards, but there are a few that do set new rules and requirements, such as prohibiting the tail docking of cows and dogs. of offending, and target specific behaviours that need to change,” Chris says. “For example, if people allow their animal’s horns to become ingrown, they can be fined $500.” In developing the regulations, current science, good practice, and the views of submitters were taken into consideration. On September 19, exactly 125 years since New Zealand became the first self-governing country in the world to grant women the vote, Te Papa will open a pop-up exhibition and launch a new Te Papa Press publication to mark Suffrage 125. A team led by Dr Bronwyn Labrum, Te Papa’s Head of New Zealand and Pacific Cultures, is using stories from the last 125 years to reflect on gender rights today. “2018 provides us with an opportunity to look at the legacy of female suffrage – to celebrate the milestones that have been fought for and won, but to also acknowledge that the battle for equality is ongoing” Bronwyn says. “I remember the centennial suffrage celebrations in 1993, and the reality is that not much has fundamentally changed in terms of advances in women’s rights in the last 25 years. There is still pay inequality, while sexism and sexual abuse are experienced at every level of society. “However, the tide certainly feels like it’s turning. There’s renewed energy, a braveness to ‘call it’ and momentum for change. I feel very hopeful about the changes we’ll be able to examine for Suffrage 150.” The exhibition, Te Tohe m ng Take W hine / Doing It for Themselves: Women Fight for Equality, will display contemporary items related to women’s rights. Recent acquisitions include a breast pump from former Green MP and writer Holly Walker, the NopeSisters T-shirt which addresses sexual abuse, a menstrual cup from MyCup, a company committed to ending period poverty, a suit worn by Dame Jenny Shipley on her first day in office as New Zealand’s first-ever female Prime Minister, and Luamanuvao Dame Winnie Laban’s puletasi (formal S moan outfit) which she wore to give her maiden speech as New Zealand’s first Pacific Island female Member of Parliament. The exhibition will be located on level 3, Te Papa and will run until the end of February 2019. True community is based on upon equality, mutuality, and reciprocity. It aﬃrms the richness of individual diversity as well as the common human ties that bind us together. is little chance of turning up to the office Christmas party wearing the same as someone else. Local shops also support local artists and designers, food producers and growers, so you’re buying products absolutely unique to your area. Bookshops, cafes and craft shops often boost the community spirit by hosting events, from book groups to knitting clubs and children’s events. If the businesses are not supported, the local groups tend to disappear too. Markets also often give space to community groups and social enterprises. Markets can have a community value, as there is often a social purpose to stalls – they can be public spaces as well as retail outlets. Local bakers throw in extra bagels for regulars; grocers give informal 10% discounts; and market stall holders are prepared to negotiate on prices. Independ-ent retailers can use their discretion to reward regular custom, and it can mean you get discounts on the items you actually want to buy, rather than being tempted by multi-buy offers in the big chains. Support your locals, and they will support you. ical care from ACC treatments, Heart Health, Mental Health support, Family planning and much more. Please visit www.newtownmc.co.nz or phone us on 3899955 to make an appointment. your feedback, Architects have created interactive design models and want your critiques to help develop these. Call Katie to hear about this month’s special offer! 30-minute evening classes for busy adults who want the physical benefits of karate without actually doing karate. Call Sensei Patricia on 027 297 6049. Call Katie to sell your home! hardwood mix $14 installations by top-qualified electrician with years of giving localshas the enjoyed Free the Delivery in Wainui Spring isrecord a timeofofover newfifty beginnings and new friendship of members locally friends arelowest beingcost invited to join Soroptimist “around-the-clock” service, and just internationally. Our summer pools were built by us. International (SI)977-8787 of Wellington who is hosting She has always seen soroptim ism as phone or 021-0717-674 or email Blends in well did cause no fuss. a High Tea at the end of September. providing friends in many walks of life jack.powell@outlook.com and for Services With hydro slide will cause a splash. SI Wellington is the local branch of an inter- and it has beenTrades important her to make And to it many people dash. national organization for women who want to contact with clubs in many countries when Situation Vacant make a difference in the lives of women and she has attended conferences and travelled, Through native bush we twist and wiggle. girls through advocacy and projects. particularly in her previous roles as club and From the children brings a giggle. One such project is the digging of wells in regional president. Severn days a week the place is open. Senegal so that women don’t have to walk five SI Wellington meets once a month to advance Hot summer days we all are hopen! hours a day to get sufficient water for their projects, share dinner at a hotel and listen to families. The wells produced so much water inspiring speakers. that these women were able to grow produce Some members are helping children with 46 Waione St Petone Public Notice and use the time productively. learning difficulties, particularly dyslexia, at Ph: 5685989 Open Sat 9am-3pm Soroptimist International also holds No.1 local primary schools and hold fundraisers Formerly cpa spares OF THE D AY status with the United Nations, which has throughout the year to raise money for specific Wainuiomata Squash Club meant that its values are heard. projects. Groups meet socially as well to enjoy Funeral Director One of several New Zealand clubs, SI Wel- theatre, film and music. AGM N  The High Tea is on Sunday 30 September at lington recently conferred life membership 51. J.K. 2 pm at All Saints Church, 90 Hamilton Road, on Bernice Croft who represents the ideals of Rowling 7.00pm Hataitai. Tickets are $20 each or 2 for $35 and President of Soroptmist International Wellington Lyn Stewart (left) presents soroptimism. chose Mondayat30th November Bernice says it has been a major part of her are available from SIWellington@siswp.org or Bernicethe Croft with a Life Membership at a club evening the Copthorne unusual At the Clubrooms Hotel last month. PHOTO: Supplied life and as well as helping women and girls she by calling 02102578905. name ‘Hermione’ Corner of Main Road so young and Moohan Streets, Wainuiomata girls wouldn’t be teased Bringing local news for being nerdy! to the community Wellington City Council is reviewing The proposed changes will extend the op initiatives aimed at reducing harm the current Liquor Control bylaw and Mt Victoria boundary up Majoribanks that would be implemented throughout Vacant has proposed some changes Situation to the Street, along both sides of Brougham Wellington. alcohol ban areas. Street to Ellice Street, and remove the “We will look at the promotion of The present bylaw expires in Decem- CentrePort area from the ban. alcohol through advertising for city A solid ber and there have been law changes “The Council is aware some people events and whether this should be which mean it needs to be reviewed, may want to extend the ban to new tightened,” Fleur says. says Social Development portfolio areas. However, the new legislation She adds the review may lead to a new leader Councillor Brian Dawson. says we need to be able to show a high local alcohol policy that could have “Alcohol control bylaws are common- level of crime or disorder which is an impact on opening hours and the ly used to manage issues caused by attributable to drinking in public before number or density of establishments people drinking in public places. we can add new areas.” throughout the city. “There will be consultation with the “They are one of many measures A consultation is now open and runs outlined in our Alcohol Management until 5pm on September 30. People community and I have already been Strategy which include regulatory tools can make a submission through the approached by some public health Deliverers Required in such as giving the police power to pro- Council’s Have Your Say section on groups who want to participate and tectArea public safety and individuals, and its website. evidence.” 1: Momona, Mohaka, Kawatiri - Kaponga. share the Council power to regulate licensed In addition to the liquor ban review, The outcome of the review will be in premises.” City Safety portfolio leader Councillor early 2019. Brian says regulatory controls on alco- Fleur Fitzsimons has initiated a review The city’s liquor-ban Applications are available at our recruitment hol use in public areas were supported of the Alcohol Management Strategy View the Wainuiomata News boundary may offi ce or at the security gate based in be the by the Police, health officials, and the that will look into evidence of what online www.wsn.co.nz Ngauranga George in Wellington. modified. accounts@wsn.co.nz general public. causes alcohol-related harm and develContact Barry 472 7987 or 021 276 6654.
is typically with the financial service provider who has refused a transaction, suspecting a scam; not with the scammer,” says Susan Taylor, FSCL Chief Executive Officer. “Our complainants have remained under the illusion that they are in a genuine relationship.” In one recent case, the complainant had been in an online relationship with a Nigerian woman for around eight years. money for him as the complainant was unable to source any of the information requested. It seemed likely that the woman he had been corresponding with was a fraudster who had skilfully groomed him over a long period of time. Susan says people should refer to NetSafe’s online resources for identifying and avoiding romance scams, including never sending money to anyone you haven’t met in person. Open Meeting Alcoholics Anonymous Kilbirnie meeting at 7.30 pm on Mondays at 620 Kilbirnie Crescent, Kilbirnie (Plunket Rooms). Commercial buildings and maintenance work. Quality assured. Taking bookings for 2019. Phone: Shane - 021987752.
plans. Free estimates provided. Call Doug on 934-1398. 2018 programme; Badminton, Climbing, Fencing, Hockey, Netball, Rowing, and Volleyball. The programme, created by Sport Wellington and funded by Wellington City Council, aims to assist regional sporting organisations to develop their talent programmes to provide optimum opportunities for young Wellington athletes and equip them for success in high performance sports environments. have been through the Sport Talent Development programme and have competed both regionally and abroad. The key aim of the Sport Wellington Performance Hub programmes, which the Talent Development Programme is part of, is to nurture successful people, not only for their sporting success but for their development as competent, capable members of society. fantastic to watch young people represent both their school and province with such pride.” Selected pool matches and finals day matches will be livestreamed on the Small Blacks TV Facebook page, giving fans a chance to watch the action. Rippa Rugby is a fun, safe non-contact form of the game where primary school-aged girls and boys participate together in mixed teams. More than 600 schools played in regional tournaments around the country in order to qualify for the national championships. sports but tennis isn’t really one of them. Rugby r efe r e e Nigel Owens is one who has earned praised for his player-friendly approach. Cr icket umpi re Billy Bowden was always a charismatic and controversial figure with his flamboyant signals. He even gave Aussie quick Glenn McGrath a red card in jest for simulating the under-arm ball in the first ever international twenty20 match. Officials need to ensure the rules are enforced, they’re not there to dish out sympathy. Kyrgios has long acted like a spoilt child on the tennis court and it’s hampered his improvement in the sport. His third round opponent, and polar opposite, Roger Federer was not impressed by Lahyani’s efforts and his actions have been the cause of much debate ever since. Best officials just stick to the rules and leave the action and the meltdowns to the players. uezone® - 3 zoned design for support . Gold® and Dreamfoam®. Firm feel. POCKET SPRING ® Features Torquezone - 3 zoned design for support BEDS and durability. Features Latex Gold® and Dreamfoam®. • Firm feel. ® and Dreamfoam®. •Queen Features LatexQueen GoldSize Size Mattress & Base Mattress & Base • 7 zoned Swisstek Pocket Queen Queen Size Size NOW NOW Mattress Mattress & Base & Base Spring. NOWNOW • Silverline infused • Firm fabric feel. bamboo WAS $3549 WAS $5899 • Features Latex Gold® and Dreamfoam®. for natural WAS $3549 WASPocket $4399 • 7 zoned Swisstek healthSpring. benefits. omfort layers that work ogether with the Firm ® core ensorzone Undeniable value for money. Nuvole and Dreamfoam Medium Feel o reduce pressure comfort layers. Designed to minimise partner WAS $6,799 Wonderfully comfortable. Designed for a continuous revitalising sleep. pointsdisturbance and improve to minimise partner disturbance for a irculation. continuous revitalising sleep. Medium Feel • Silverline infused Wonderfully comfortable. Designed Beautifully designed Medium Medium Feel Feel bamboo Medium Feel with natural latex gold WITH to minimise partner disturbance forfabric a comfort layer and individually encased full height WAS $4,499 Beautifully designed with natural latex gold Wonderfully comfortable. Designed Beautifully designed with natural latex gold natural continuous revitalising for sleep. pocket springs to minimise partner disturbance. comfort layer anddisturbance individuallyfor encased full height to minimise partner a comfort layer and individually encased full height health benefits. pocket springs to minimise continuous revitalising sleep. partner disturbance. pocket springs to minimise partner disturbance. balancingfabrics comfort layers forfor a great night’s sleep. ideal sleepovers antibacterial and luxury wool fibres. *Offer valid from 20/08/18 to 18/09/18 or while stocks last. Excludes Everyday Dream Prices. Offer cannot be used in conjunction with any other offer. 30 day comfort guarantee T&Cs apply. ENT *Offer valid from BEDS 20/08/18 STORE NAME BEDS RNAME US STORE R to US18/09/18 or while stocks last. OUP Excludes Everyday Dream Prices. Offer cannot be used in conjunction Details PROUD TO BE LOCALLY Address DetailsAddress PROUD TOQBECard LOCALLY *12 MONTHS INTEREST FREE OFFER: and Financial Services lending *Offer valid from 20/08/18 18/09/18 or whileLatitude stocks last. with any other offer. 30 daytocomfort guarantee T&Cs apply. ‡ OWNED AND OPERATED OWNEDapply. AND OPERATED criteria, fees, terms & conditions 48 MONTHS INSTALMENT INTEREST FREE Ph: 00 123 4567 Ph: 00 123 4567 Excludes Everyday Dream Prices. Offer cannot be used in conjunction OFFER: Daily payments are 48 with *12 INTEREST OFFER: Q only. Card andmonths Latitude Financial interest Servicesfree lending withMONTHS any other offer. 30FREE dayindicative comfort guarantee T&Csinstalment apply. Gemvalid Visa/Gem CreditLine an apply. instalment advance a CreditLine *Offer 13/06/2016 toas10/07/2016 orplan while stocks(Gem last.Visa) Excludes Everyday Dream Prices criteria, fees, terms & conditions *Offer valid 13/06/2016 to 10/07/2016 orOFFER: while stocks last. Excludes Everyday Dream Prices *12 MONTHS INTEREST FREE Qspend Card and Latitude Financial Services lending Select advance (Gem Amount payable will be shown on your monthly and clearance stock.CreditLine). Minimum $999. Lending criteria, $50 Annual Account fee, and clearance stock. Minimum spend $999. Lending criteria, $50 Annual Account criteria, fees, terms & conditions apply. statement. Gem Visa/Gem CreditLine is provided by Latitude Financial Services. Establishment fee, terms and conditions apply. See counter for full terms andfee, conditions. balancing comfort layers for a great night’s sleep. Medium feel. WAS $5599 eatures Latex Gold® and Dreamfoam®. dzoned Swisstek WAS $5599 WAS $5599 ocketFirm Spring. Withinfused advanced comfort technology including lverline Firm 7 dedicated posture zones, naturally superior amboo Withfabric advanced comfort technology including antibacterial fabrics and luxury wool fibres. 7 dedicated posture zones, naturally superior or natural antibacterial fabrics and luxury wool fibres. ealth benefits.